Did you know that Oregon produced 99% of the worlds hazelnuts?! Yes, it’s true! That is a lot of nuts! Well not only do we live in Oregon’s wine country but also Oregon’s nut country too. As you drive over the hill into wine country, also know as Rex Hill, there is a cute little white stand on the right side of the road. 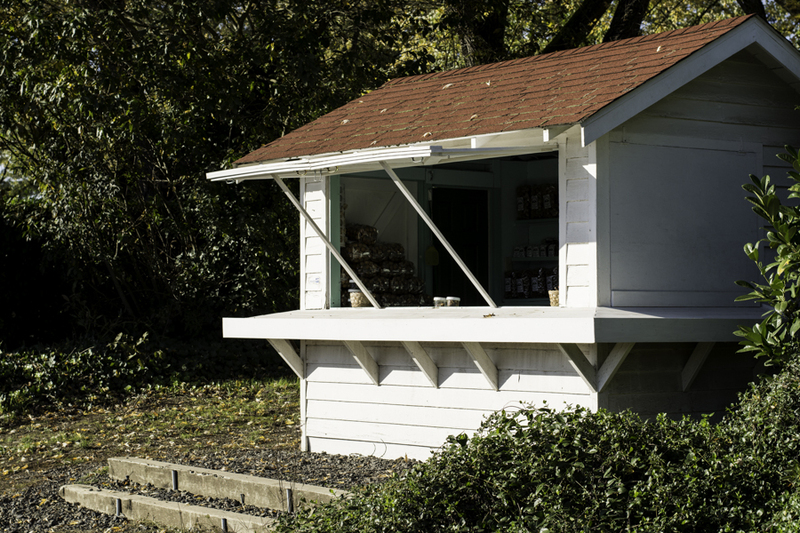 They sell Oregon Hazelnuts and Walnuts every year. It only opens in November and closes after the Christmas holiday. I finally had the chance to stop by a few weeks ago…. I had these scones in mind when I stopped in at the Hazelnut stand. This was my first attempt and cracking and roasting whole hazelnuts. I’ll admit I had no idea what I was doing, haha! A few cracks with the mallet and I was cracking hazelnuts like a pro…so I thought anyway! I roasted these for 20 minutes on a sheet pan at 325 degrees. Roasting them is a must. They take on a whole other flavor profile when roasted. There are so many uses for hazelnuts… put them in your salad, roast them with some spices and eat them for a snack, crush them and use as a coating on salmon, and of course bake with them. If you do not want to go to all the trouble of cracking your own nuts, they also sell roasted shelled hazelnuts for you to use right away. The lady told us these hazelnuts in the shell will last 6 months in a cool dark place such as a cellar or garage. So I opted for the in shell version so I can enjoy these for awhile. 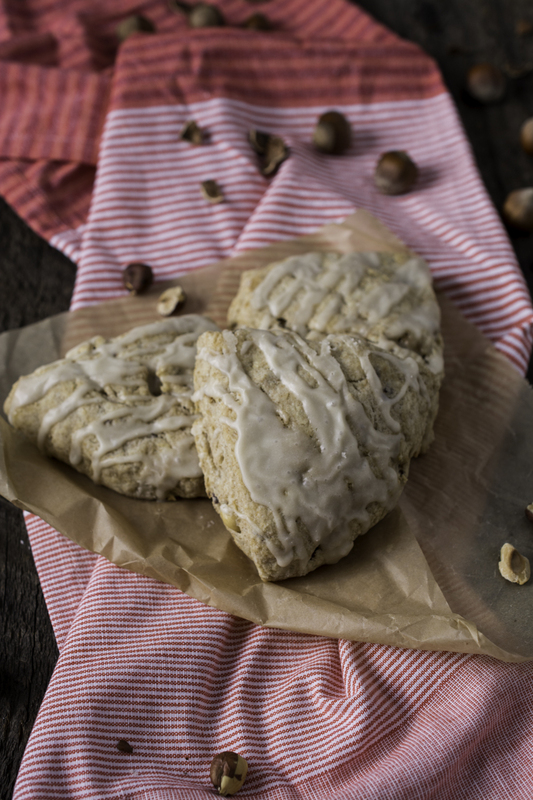 These scones baked with whole wheat flour, some roasted hazelnuts and drizzled with a maple glaze are perfect for your weekend baking. 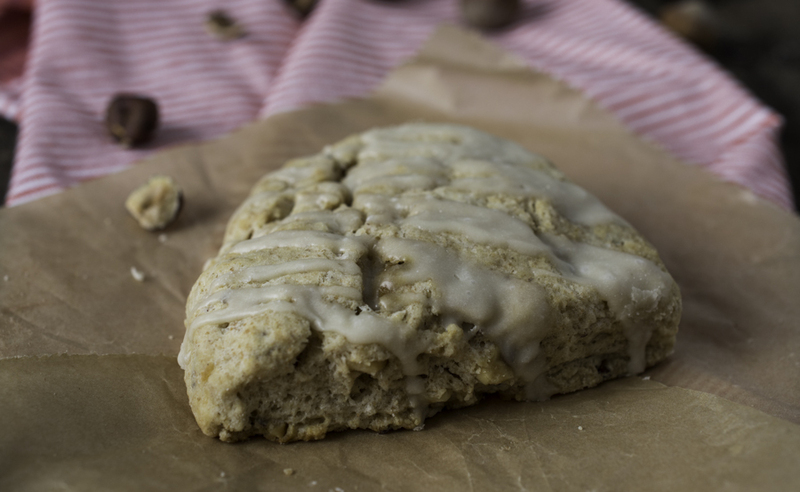 I like baking scones because they are pretty forgiving and bake up in about 20 minutes. No need to roll and chill, or wait for dough to rise… just mix, shape and bake. Also perfect for these busy times during the holidays. 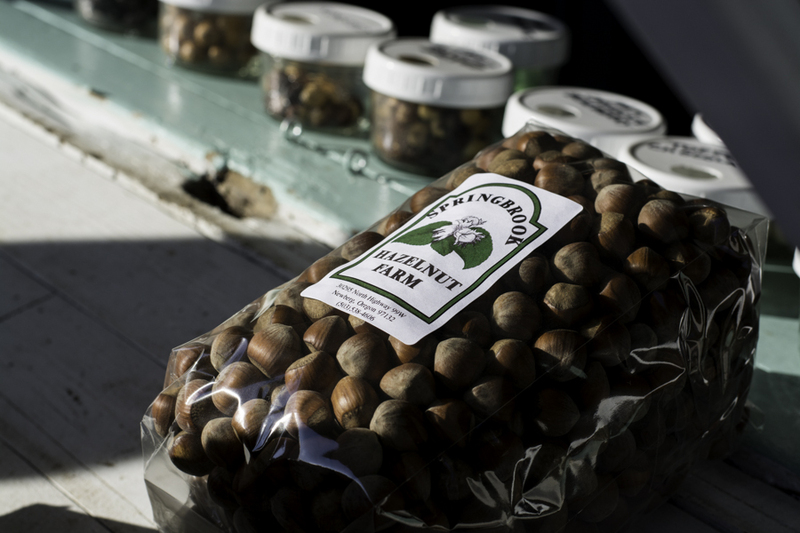 On your next weekend out to wine country, stop by the little white stand on the bottom of Rex Hill and pick up some Oregon hazelnuts…you will be glad you did! Cheers to the busy holiday season and soon to be winter! In a large bowl, combine flours, brown sugar, baking powder, and salt. Use a pastry blender or your hands and blend together the butter with the flour mixture until it resembles small peas or crumbs. Stir in the hazelnuts with a spatula. In a small bowl, stir together the buttermilk and vanilla, slowly add to the flour mixture until just mixed together. Turn out onto a floured surface and knead for a minute or two. Shape into a large flat circle, with a bench scraper or knife, cut into 6-8 wedges. 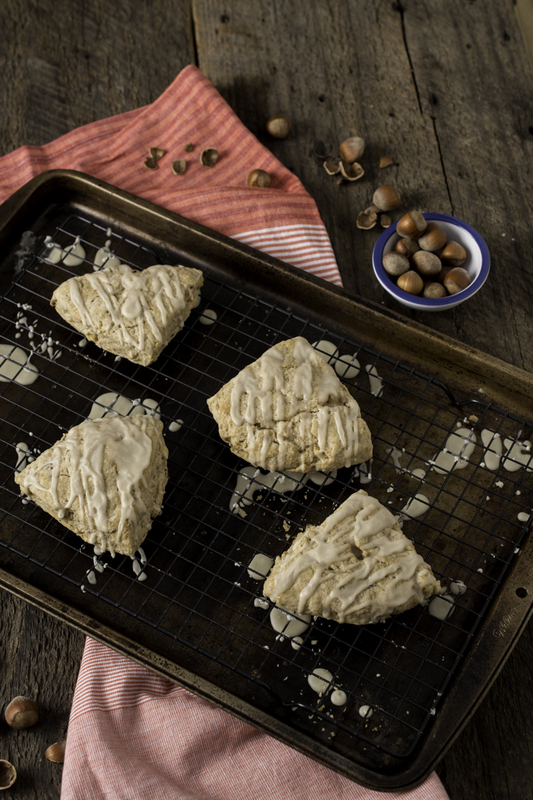 Place scones on a silpat/parchment paper lined baking sheet and bake for 20-25 minutes. Melt the butter in a pan or microwave.Pour into a bowl with the powdered sugar, and add the maple syrup and vanilla. Whisk until smooth. For a thicker glaze, add more sugar. Let scones cool on a wire rack before adding the glaze. I already have the perfect tea picked out for those. Hazlenut everythang! This looks amazing and sounds so yummy. I love hazelnuts and scones! Both in one, love it!